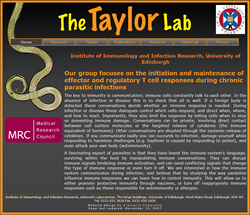 Matt Taylor’s Lab at Edinburgh University, studying immune responses in parasite infections. 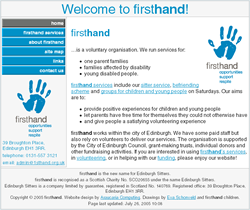 Various other websites for research groups at the University of Edinburgh, including: Alex Rowe’s Lab, Andrew MacDonald’s Lab, and the Allen Parasite Immunology Lab. 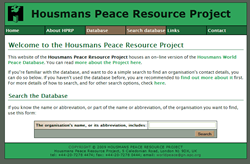 The Housmans World Peace Database is an authoritative listing of peace and related organisations around the world. It’s the most comprehensive and up-to-date database of its kind. This site uses a MySQL database together with PHP. 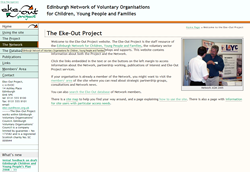 Website for the Eke-Out Project, the Edinburgh Network for Children Young People and Families. The Overcoming Violence Project set up local initiatives in seven Scottish schools working on ways to reduce violence. 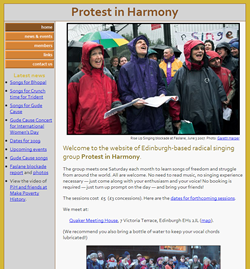 Protest in Harmony is an Edinburgh-based radical singing group. Visit GKB Enterprises if you’re interested in Scots poetry and Victorian theologian William Robertson Smith. 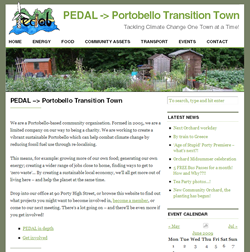 A WordPress-based site for local environmental campaign group PEDAL -> Portobello Transition Town. 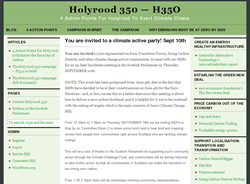 Holyrood 350 is seeking to persuade the Scottish Government and MSPs of all parties to introduce legislation and take the critical steps which can enable us to reduce CO2 concentrations from the current 387ppm to 350ppm, in order to avoid catastrophic climate change. Another WordPress site.